Christmas season in New York is a really special time, the atmosphere is indescribable; you’ll be amazed by the countless lights and magical decorations. 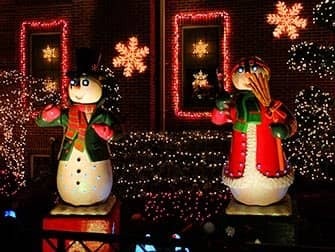 For Americans, Christmas is an important holiday and this is reflected in the enthusiasm with which they decorate their homes. Every year a huge Christmas tree is illuminated at the Rockefeller Center and the windows of the shops on Fifth Avenue are beautifully decorated! 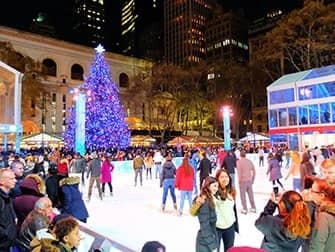 If you are in New York during the Christmas season, there are several activities that you can do to soak up this atmosphere. If there is one thing in New York that will surely put you in the Christmas mood, it’s the beautifully decorated streets and shop windows. Big department stores really dedicate the whole year to preparing their Christmas window displays, each telling its own story. The shop windows are somewhat of a gift to the public and are not prominently sales-driven. It’s popular for both locals and tourists to wander past the stores during this period, especially on Fifth Avenue. 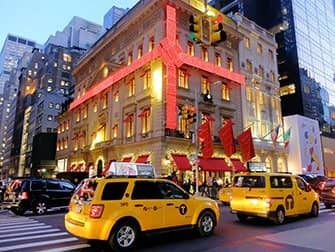 The department stores with the best shop windows are: Bloomingdale’s, Bergdorf Goodman, Saks Fifth Avenue and Tiffany’s. Macy’s should, of course not be missed. When will the Christmas decorations go up? The Christmas decorations in shops are usually revealed at the end of November, beginning of December: typically after Thanksgiving. This is also the case for the Rockefeller Center Christmas Tree. After New Year, most of the shops will remove their decorations. The Rockefeller Center Christmas Tree will be taken down in the first week of January, the lights are usually turned off at 21:00 on that specific day. The department store Macy’s has dedicated a whole floor to a magical Christmas village called Macy’s Santaland. Everything is beautifully decorated. Even Santa Claus is present and you (or your children) can snap a photograph (for a fee). Bare in mind that the queue for taking a photo with Santa can be very long. 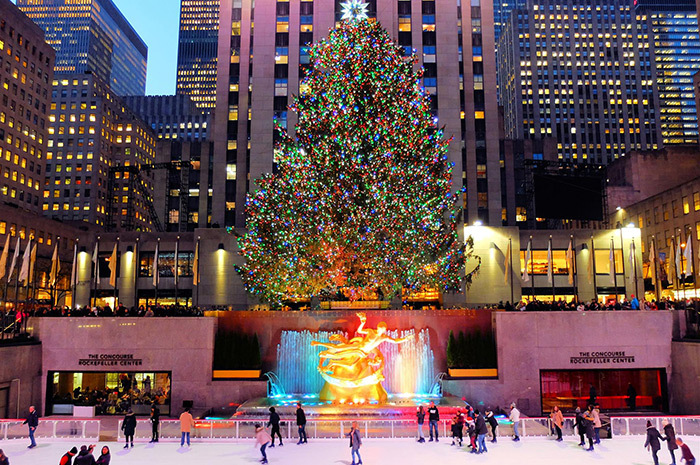 The famous Rockefeller Center Christmas Tree is an attraction in its own right. The tree needs to be a minimum of 20 metres tall and around 7,5 metres wide but it’s usually much taller (between 23 and 27 metres). The Rockefeller Center Christmas Tree is decorated with 8 kilometres of fairy lights. In 2019, the tree lighting ceremony will take place on December 4th. The lights will be turned off in early January 2020. The tree is illuminated daily from 05:30 until 23:30 and over Christmas is illuminated for 24 hours. On New Year’s Eve, the lights are turned off at 21:00. The turning on of the lights of the Rockefeller Christmas tree is a big occasion in New York and there is an elaborate ceremony beforehand. It gets very busy at Rockefeller Center during the ceremony, everyone wants to catch a glimpse of the Christmas tree. The ceremony is broadcast live on TV and watched by millions of Americans. A chance to see a famous singer perform is expected. The VIP tickets to see this spectacle are sold out every year so be quick if you want to get tickets. With these tickets you have the best seats. From the elegant cafe you have a good view of the beautiful Christmas tree and can enjoy unlimited drinks and snacks. There is also a DJ. The Rockefeller Christmas tree is decorated with more than 50,000 LED lights and the electrical wiring is longer than 8 kilometres! Turning on the lights of the Christmas tree is a real spectacle that is great to experience. Keep in mind that those without VIP tickets must stand for hours in order to get a spot to watch the show. The blocks surrounding the area are jam-packed with people standing in the cold waiting, which also means getting around in that area is crazy, even on foot. Most New Yorkers that aren’t going to the show avoid it. In fact, the office buildings in Rockefeller Plaza close at lunchtime in order to help the employees get out of there safely. The tree lighting events sell out quickly. If the tickets for the gala are sold out, you can try to book tickets for the Rockefeller Center Christmas Tree Lighting Party. Eric’s Tip: Is money no issue and would you like to experience a memorable event? Then go to the ceremony. You can be sure you’ll get the best seats and you’ll avoid the crowds. Additionally, you can see how real New Yorkers welcome the Christmas season! 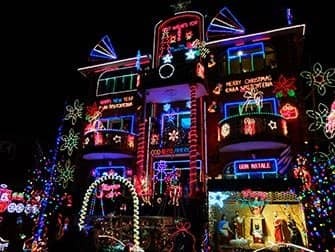 The Christmas lights decorating American houses are breathtaking. To see exuberantly decorated houses (you certainly know them from series and movies) you should not stay in Manhattan but go to Dyker Heights in Brooklyn. This affluent area has even been chosen as the “best-decorated neighbourhood of America”. Take part in the 3.5 hour Brooklyn Christmas Lights Tour of Dyker Heights and explore the beautifully lit and decorated homes. The tour begins in Midtown where your bus with guide heads to Brooklyn. Once in Dyker Heights, you won’t believe what you’re seeing! Some of the extravagant creations cost more than $10,000. To keep your Christmas spirit high, Christmas videos and Christmas carols will be played in the bus. 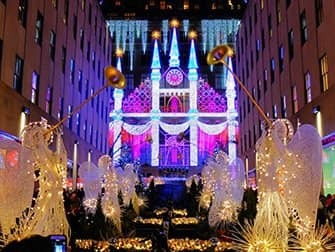 Eric’s Tip: If you are in New York during the Christmas season, this tour is a must. You get to see the houses as you know them from American series. During the tour, there is plenty of time to take pictures and you’ll be amazed by the decorations. This tour will certainly get you in the Christmas spirit. Note that it is very popular, so it’s best to book in advance. In addition to a beautiful Christmas tree, Rockefeller Center is also famous for its skating rink. Skating in New York at Rockefeller Center is a great experience. The queues at the Rockefeller rink can be quite long. Do you want to skate here during the Christmas season? Then you can opt for a VIP package. You will have access to the chalet, next to the ice rink where you can relax after and during skating and warm up with hot chocolate, coffee, and biscuits. All this is included in the VIP package. And there’s more! This package also offers free access to the Top of the Rock. From the observation deck on the 70th floor, you can enjoy the view of New York City. Eric’s Tip: This package is great for the whole family. You get to skate during a very wanted time slot and you can make use of the VIP-chalet. With this package, you can enjoy skating on one of the most popular rinks in New York without the hassle and lines. 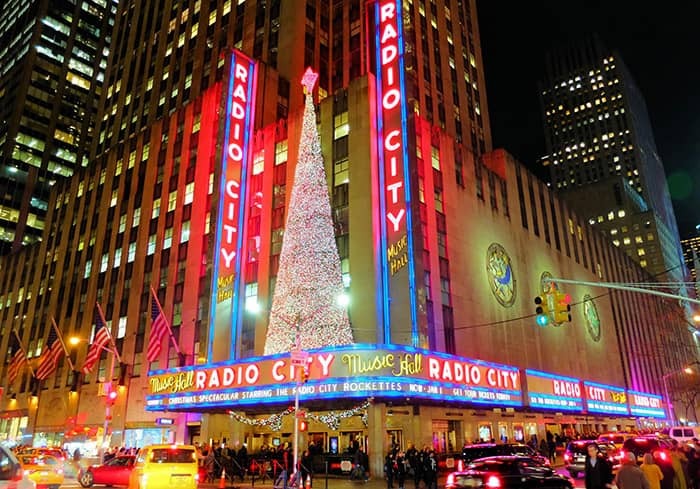 The Radio City Christmas Spectacular, starring The Rockettes is one of the most iconic Christmas shows in New York. It includes Santa, the Nutcracker and of course the Nativity. Starting in early November, you can visit one of the many shows a day. If you’ve already seen the show once you can definitely go again, as the show’s a bit different every year. 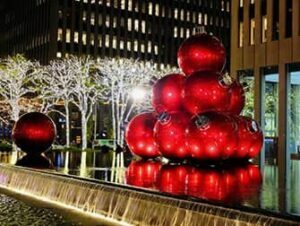 It’s held at Radio City Music Hall and is truly the best way to get into the Christmas spirit. Do you want to see the highlights of Christmas lights in New York but don’t want to do it on your own? Then take this bus tour. The bus drives through the city, past the famous Rockefeller Christmas tree and the great displays of the shops on Fifth Avenue. There will be eight stops where you can get off the bus and take a short walking tour. The Rockefeller Christmas tree is only lit in late November or early December. To avoid disappointment, I advise you to take the tour only after the tree has been lit. 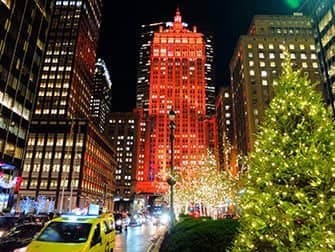 Get well and truly in to the Christmas spirit during this festive Christmas cruise in New York. Aboard this 1920s, vintage-style yacht enjoy hot chocolate, cookies and Christmas songs performed by a live band as you pass the Manhattan skyline. 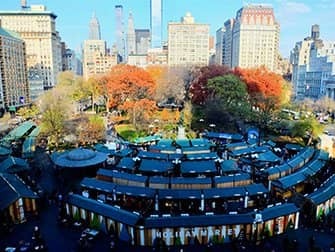 In New York, there are a number of Christmas markets that you can visit. Two of the best are Bryant Park and Union Square. 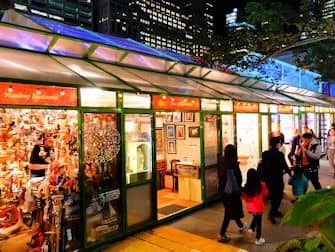 The Bryant Park Christmas Market starts from October 27th until January 2nd, 2019. This is a large market and because you can also go ice skating and sit in the cafe, it’s the absolute best Christmas experience. You can buy Christmas decorations and ornaments. The Union Square Christmas Market is a little smaller. It’s on from November 15th to December 24th, 2018 (closed on Thanksgiving). At this market you can get food and presents. These Christmas markets aren’t cheap but it’s all about the experience, after all. I once bought a New York taxi tree ornament, as well as a hotdog stand one! You can also join a Christmas Market Walking Tour. The Nutcracker is performed by the New York City Ballet each year during the holiday season, starting from the end of November until the beginning of January. With music by Tchaikovsky and choreography by Balanchine, it’s a classic piece loved and watched by many. If you’re in New York, you can enjoy the magical Christmas world including the toy soldiers and incredible visual effects in the David H. Koch Theatre.